Thanks to the Federal Reserve's Zero Interest Rate Policy (ZIRP), treasury bonds are now returning their lowest yields in history. Bond prices and bond yields are inversely proportional. With interest rates having nowhere to go but up, bond prices have nowhere to go but down. Retirees holding a majority of their wealth in bonds could see their principle cut by a significant amount as interest rates rise. This bond bubble could continue on for years, but eventually it will burst. The rise in bond rates could occur in a few ways. First, the Federal Reserve could raise rates if they believe that the economy is on a sustainable recovery. Fed Chairman Ben Bernanke's recent allusion to this caused bond rates to immediately surge. A second way that bond rate could rise is through reduced confidence in the ability of the US government to pay their debt. On August 5, 2011, Standard & Poor's, one of the "big three" ratings firm, downgraded the US Government's credit rating for the first time in history. Ratings firm Egan-Jones has cut the US government's credit rating three times over the past few years over concerns with the Federal Reserve's quantitative easing. A third way that bond rates could rise is if China decides to stop buying US debt. China is currently the largest foreign buyer of treasury securities and has $1.2 trillion in holdings. If China began cutting back on its purchases, or worse, began selling its existing holdings of US bonds, interest rates would rise significantly. This combination of historically low interest rates and the inevitability of lower future bond prices has caused many analysis to begin calling US treasury bonds "return free risk" (a play on "risk free return" - the role that treasury bonds have historically played). Clearly it doesn't pay to be in bonds right now. As treasury yields have plummeted to historic lows, investors have set out on a quest for higher yields in fixed income securities. The first methods for finding higher yields is investing in longer maturity bonds. Instead of buying 10-year treasury bonds with a 2.25% interest rate, retirees may now be investing in 30-year treasury bonds with a 3.37% interest rate. The problem with this approach is that the prices of longer maturity bonds are more highly leveraged against interest rates. When interest rates rise, as they inevitably will, people holding 30-year bonds will get burned far worse than people holding 10-year bonds. A second method of finding higher bond yields is to move into riskier bonds. Instead of buying treasury bonds, retirees may park their money in corporate bonds, municipal bonds or even junk bonds. While the yields of these bonds may be higher, the risk of default is higher as well. If the economy enters into another severe downturn, many companies and cities could enter bankruptcy, leaving bond holders with nothing. A third path to higher bond yields it to look internationally. Just as with the other options, this one carries increased risk. Buying foreign bonds exposes the investor not only to the sovereign default risk of the country they are buying from but also to risk of currency fluctuations between their home currency and the currency that the bond is denominated in. Nevertheless, many investors are beginning to look overseas for increased bond yields. For investors worried about peak oil, it is possible to buy government bonds from 5 of the top 10 oil exporting nations: Russia, Nigeria, Venezuela, Norway, and Canada. As we pass peak oil and oil continues to get more expensive, government revenues should continue to increase for these countries, ensuring that they can avoid sovereign default while oil importing nations like Japan and the United States struggle. Buying Nigerian 10-year government bonds, for example, can land you a whopping 14.4% yield today. For investors simply wishing to reduce their exposure to US default risk, Canada and Norway 10-year bonds have about the same return as US treasury bonds but with arguably a much lower risk of default. While the income from a typical 50/50 stock/bond portfolio has fallen by half over the past 20 years ago, many retirees are also finding that the cost of living in retirement has risen sharply over the same period. 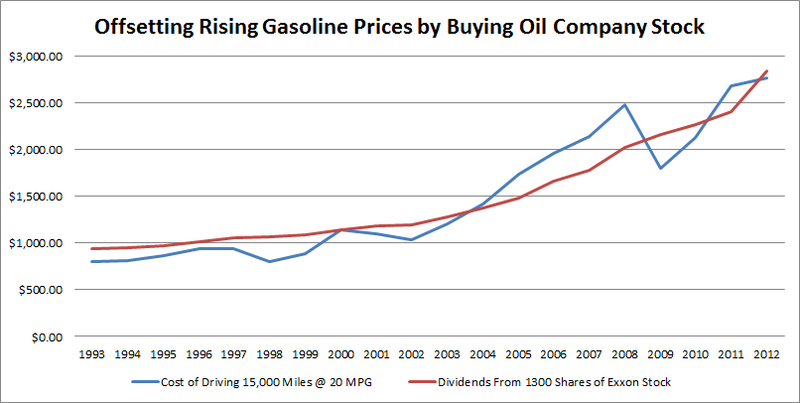 The price of gasoline, for example, has doubled over the past decade. 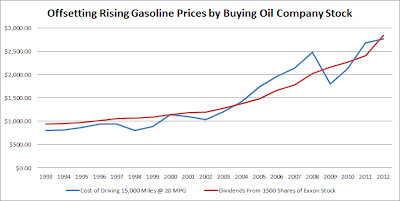 If you wanted to hedge against the cost of driving, you could buy 1300 shares of ExxonMobil stock and over the past 20 years the dividends you would have received would have almost perfectly offset the increases in the price of the gasoline you purchased each year. The problem is, it would have cost you just $12,000 in 1993 to buy 1300 shares of ExxonMobil stock, but in 2013 you'd have to spend nearly $110,000! We may not be at peak oil yet, but we are certainly feeling the effects. Food prices have also doubled over the past decade. Because each calorie of food we eat requires 10 calories of hydrocarbon energy to produce, it is no wonder that the rise in oil prices nearly is nearly perfectly correlated to the rise in food prices. Combined with declining investment income, these rising costs of living are pushing retirees further in search of investment yields. Without any good option in bonds, many investors have sought out yields in other asset classes, like annuities, royalty trusts, master limited partnerships and real estate investment trusts. All of these asset classes, however, usually carry increased risk of default and price volatility. In the case of annuities, investors face serious counter-party risks -- people holding Lehman Brothers annuities before the last crisis are lucky if they got anything following the bankruptcy. This leaves investors with just one place left to go for increase yields: stocks. 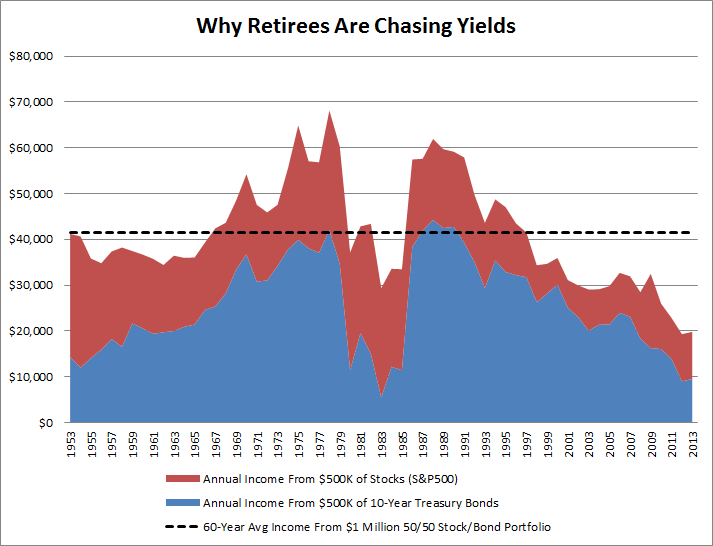 With retirees desperate for income and the value of treasury bonds certain to plunge at some point in the future, it is no wonder that investors are pouring their money into equities in the hope of receiving dividend income. By doing so, however, these investors are simply piling on more risk. Not only does the underlying value of stocks tend to swing far more wildly than bonds, but unlike the coupon of a bond, which you're guaranteed to get as long as the bond issuer doesn't default, continued high dividends from companies are far from a sure bet. If we enter another downturn, dividends could fall as companies try to shore up their balance sheets. Despite these risk, investors continue to pile into stocks in the quest for higher yields. I believe that this reality helps explain why the stock market continues to hit record highs as the real economy continues to drag along with high unemployment and near zero real growth. I certainly don't have a crystal ball, but I do have an uneasy feeling about the current "recovery" here in the United States.